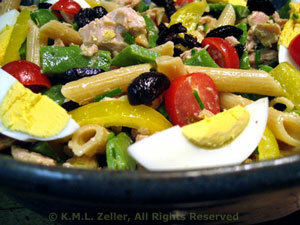 Niçoise Pasta Salad, easy mid-week dinner. Top and tail beans and cut in half. Fill a medium saucepan 2/3 full of water and bring to a boil over high heat. Add beans and blanch for 3 minutes. Whisk vinegar, mustard and lemon juice. Slowly add oil, whisking until it emulsifies. Add tarragon, chives, stir and put into a large salad bowl. Slice tomatoes, cut slices into quarters and add to vinaigrette. Clean pepper by cutting in half and discarding seeds. Slice half of the pepper and add to vinaigrette. Cut olives in half and add (you get the picture.. - stir gently after each addition.). When pasta is cooked, drain and add to mix in salad bowl. Quarter eggs and arrange on top. Garnish with anchovies, if desired, and serve.